The tomb of Sultan Murat III was built by Architect Davud Agha and his assistant Dalgic Ahmet Agha four years after the death of Sultan Murat III in 1595. It is located in between the Princes Tomb and Tomb of Sultan Selim II. 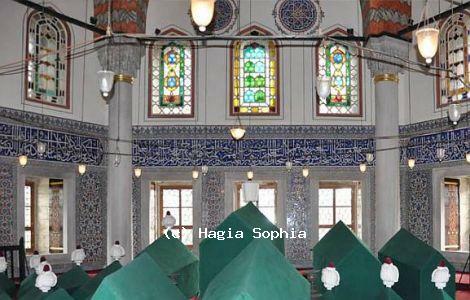 The tomb of Sultan Murat III has hexagon layout, two domes and arched entrance. The facade of the structure is coated with marble. This tomb is accepted as one of the largest Ottoman Tombs. The tomb seems plain from outside but it is very beautiful decorated inside. It has the most beautiful examples of coral red Iznik ceramics dates back 16th century. Hand drawn ornamentation are decorating interior walls. White color polished ceramic tiles on navy blue background create a belt of Celi Sulus style calligraphic decoration inside. Tomb has 3 rows of windows and the lower row windows have wooden kundekari cupboards among themselves. Entrance door of the structure has Kundekari style and it is decorated with mother of pearl inlays. There are total 54 sarcophagi in the tomb belong to Sultan Murat II, his wife Safiye, his daughters and princes and courtier women.